I’m quite a beginner in gardening and have never grown foxgloves. All I know about them is that they are incredibly tall and bumblebees love them. So when I started stitching my next flower from ‘Garden Party’ design I thought it wouldn’t be my favourite one. I’m also usually sceptical about scaling down large plants for miniature silk ribbon embroidery, as, let’s be honest, it is very hard to make tiny piece that still got enough detail to look life-like. After all, two already finished flowers — forget-me-not and wisteria — are quite rich in detail, the foxglove should match them to feel in place. With these thoughts and somewhat skeptical attitude I made the first bright pink foxglove (or it might be a hollyhock) and immediately fell in love with it as soon as it was finished. 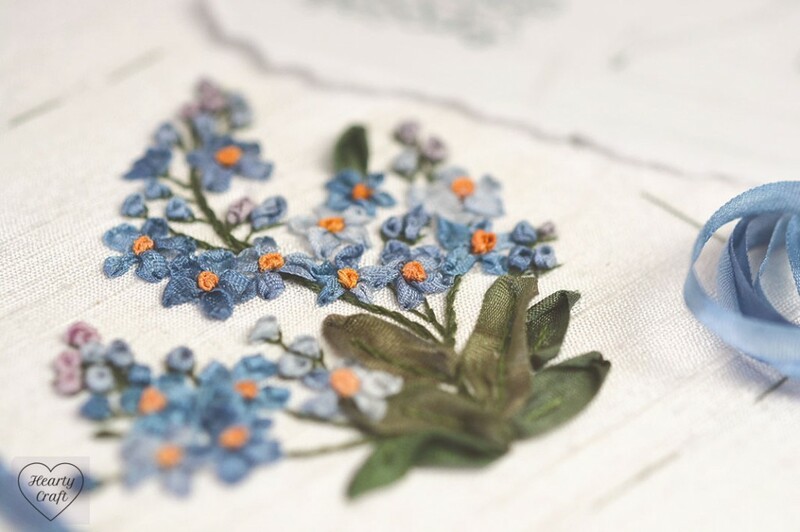 There are so much details in this small embroidery. You don’t notice them when you see the whole picture, but you do recognise them whilst stitching. And the flowers are so bright and crisp in colour — everything that I love. It’s common to stitch foxglove flowers with ribbon stitches, that’s why I reckon it might be a mistake in a magazine where I got the pattern from and it’s a hollyhock as a matter of fact. Anyway, I like Helen Ericsson’s choice to go for the gathered flowers. They might look not as an identical copy of real foxgloves, but the stylisation is absolutely charming, and the flowers are strikingly recognisable. They remind me of a cottage garden. This entry was posted in Blog Posts and tagged Inspiration, Silk ribbon embroidery on 28th May 2015 by Zinaida. I’m still very enthusiastic about completing Garden Party design by talented Helen Eriksson and here is one more plant finished — a wisteria. It’s the second flower out of nine, the first one is forget-me-not that I’ve shared earlier. The whole panel is worked in silk ribbon embroidery technique, and what I love about it most is that finishing each flower takes no time at all and all of them look very realistic indeed (at least on photos in a magazine with stitching instructions). 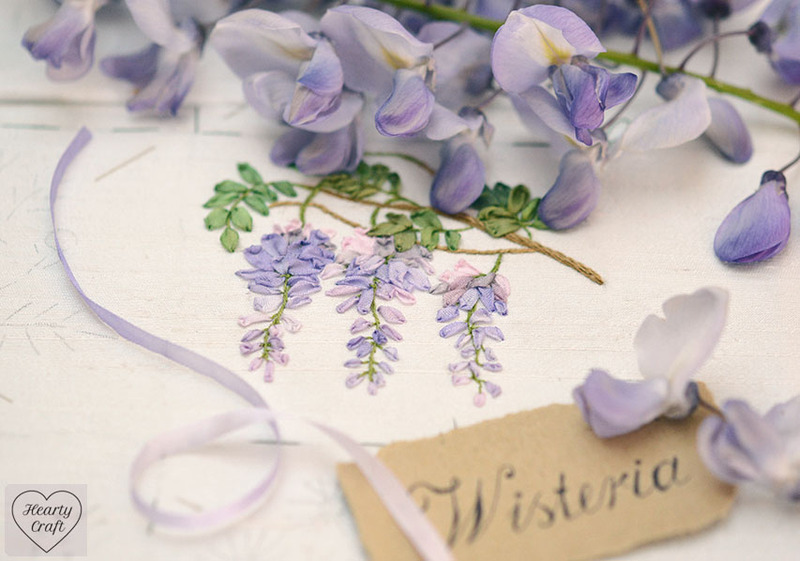 I wasn’t sure when I just started stitching the wisteria that my embroidered version would look real-like, but as soon as finished it, I totally fell in love with it and there’s no doubt in me that it’s highly recognisable. At first I thought that suggested silk ribbon would be too pale for the design, but surprisingly its subtle variations worked well here, so I didn’t consider any other options at all. I used the darkest ribbon sections for upper parts of the bunches and the rest for lower parts as were recommended in the magazine. This entry was posted in Blog Posts and tagged Inspiration, Silk ribbon embroidery on 15th May 2015 by Zinaida. I’m totally in love with my new textile postcard. It’s stitched on one of those fabric backgrounds I stock. I’m still not sure if it’s a cherry or an apple blossom. First I thought it’s an apple, but pink stamens made me a bit suspicious and now it looks more like a cherry for me. Anyway, flowers of both species are similar in shape and it’s the same way to go about stitching them. I used my favourite silk ribbon embroidery technique to brighten up the print. This entry was posted in Blog Posts and tagged Free Patterns, How to, Inspiration, Patterns, Prints, Silk ribbon embroidery, Stitches, Tutorial on 8th May 2015 by Zinaida. 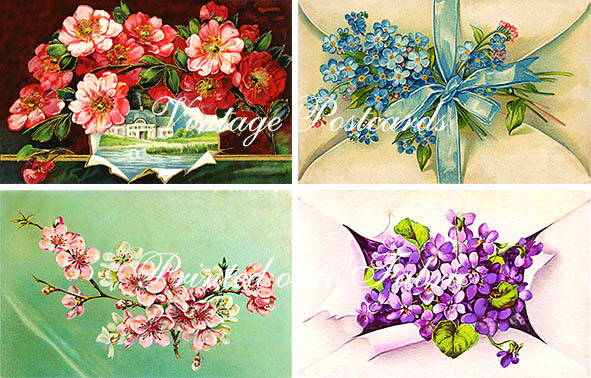 Every now and then I am asked whether there are any plans to stock printed panels for silk ribbon embroidery, so I have been considering it for some time. The problem is that it’s not an easy job to make a quality print to serve as a backdrop for embroidery. After all, if it was easy, there would have been plenty of them on the market! However, I’m delighted to report that after a number of false starts and dead ends I managed to tackle numerous obstacles, so now I think I have an answer. 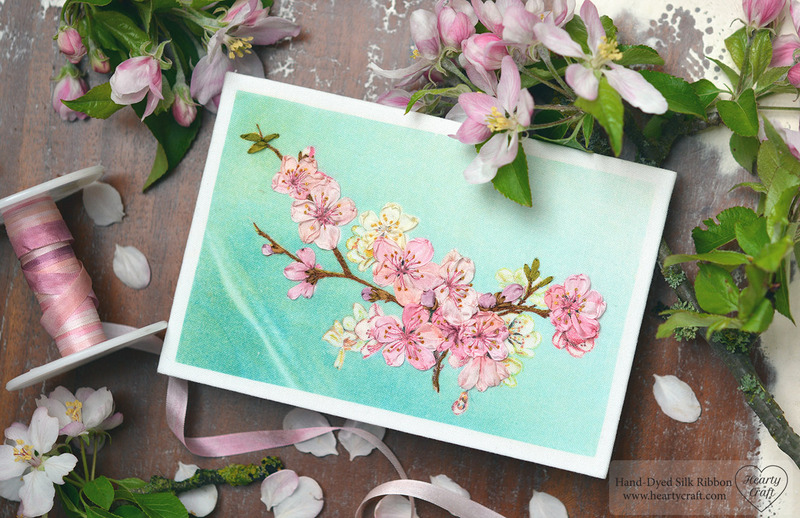 Please welcome — crisp in colour and fine in detail — a series of vintage fabric postcards! This entry was posted in Blog Posts and tagged Inspiration, Patterns, Prints, Silk ribbon embroidery on 29th April 2015 by Zinaida. I stitched this piece just before Easter, but couldn’t find time for sharing it. We moved house, at the end of March, then it was Easter break, then it was never-ending struggle with boxes all over the place, and finally yesterday I finished unpacking my studio stuff and put all the things on their places, so I can comfortably do my job again. The rest of the house is still a real mess though, but at least one room here — my studio — looks nice and tidy. To celebrate the fact I’ve arranged some photo shooting today whilst it’s still spring here and my seasonal embroidery hasn’t got completely outdated. If you follow me on Instagram, you might have seen it already there. I managed to post a photo of the unfinished embroidery just before moving. This is a postcard I made. I love simple ways of finishing embroidery pieces, and I’ve got an idea of making a collection of silk ribbon embroidery postcards. They would look lovely pinned to a wall in my studio, and it does take little time to complete such a small embroidery. In fact it took me about two evenings to finish it including time I spent making the design and choosing materials! 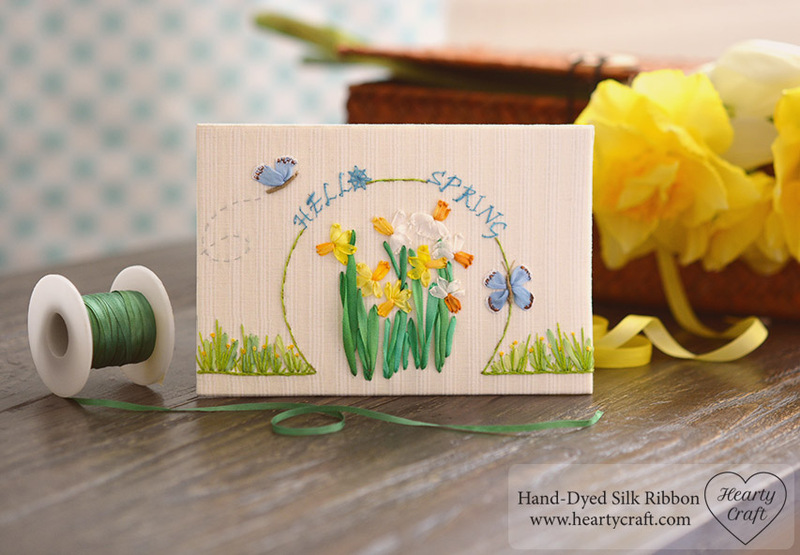 This entry was posted in Blog Posts and tagged Inspiration, Silk ribbon embroidery on 17th April 2015 by Zinaida. Britain is in daffodil bloom and even in my shady garden the flowers have opened. I have not met a person who doesn’t love daffodils. They are pure sun and its so much joy to walk past yellow flower carpets. Daffodils are truly messengers of spring, and when I see their strong stems and leaves that show over ground, I know Spring is almost here, and the most beautiful season of bloom is ready to come. 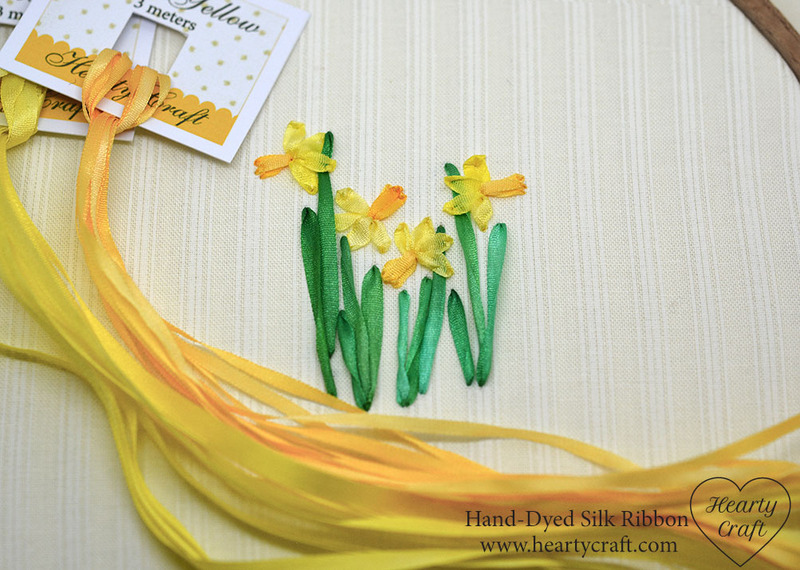 Here is a tutorial on how to easily embroider beautiful daffodils with silk ribbons. The tute is well suitable for those who have not tried silk ribbon embroidery before, and want to give it a go. Two pieces of cotton fabric plain or patterned. I used Moda fabric bought in a quilt shop. This entry was posted in Blog Posts and tagged Free Patterns, Silk ribbon embroidery, Tutorial on 4th March 2015 by Zinaida. single sided and double sided adhesive tape. This entry was posted in Blog Posts and tagged Free Patterns, Roses, Silk ribbon embroidery, Tutorial on 10th February 2015 by Zinaida. 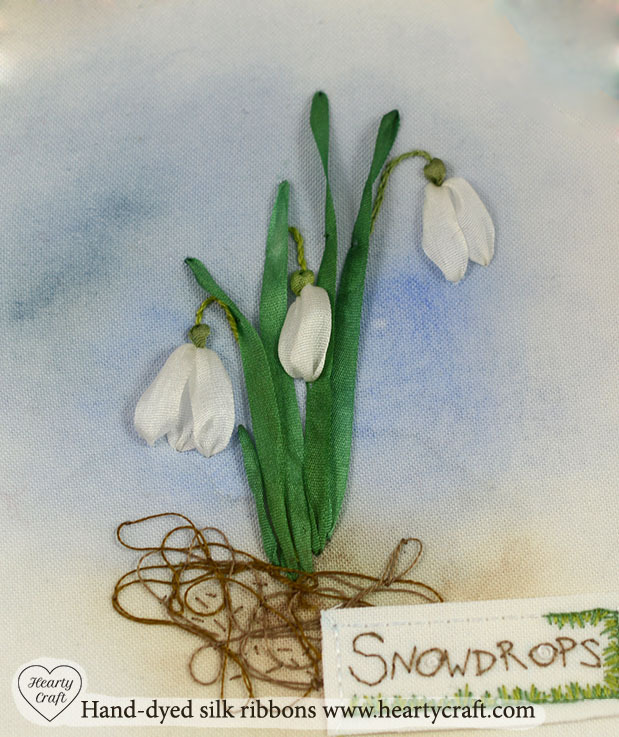 I played with 2mm silk ribbon today and stitched a lovely tiny bunch of snowdrops! The tallest flower is just 4 cm high. It turns out that smaller bunch is even easier and quicker to embroider that ones I stitched with 7mm and 4mm silk ribbons a week before (I posted a tutorial earlier if you missed it). This time I got lazy and didn’t transfer the patten onto fabric, so I didn’t follow the steps of my own tutorial strictly and went the other way round. The flowers were stitched at first, not stems and leaves as it is said in the tutorial. It’s quite easy to start with flower heads when there isn’t any layout on fabric. I worked flowers as described in the tutorial, but used 4mm white silk ribbon instead of 7mm one. For some snowdrops I stitched three petals, for others just two. Then I worked calyxes on top of each flower with 2mm wide Pastel Green silk ribbon and a straight stitch again as it’s suggested in the tutorial. This entry was posted in Blog Posts and tagged Free Patterns, Silk ribbon embroidery, Tutorial on 5th February 2015 by Zinaida. Snowdrops are one of the most lovely woodland flowers. They’re beautiful spreading in white endless carpets making our walks in woods so much more enjoyable. I love how rich green shades of their leaves bring forward white delicacy of flowers. It’s amazing colour combination that is easy to replicate in silk ribbon embroidery. 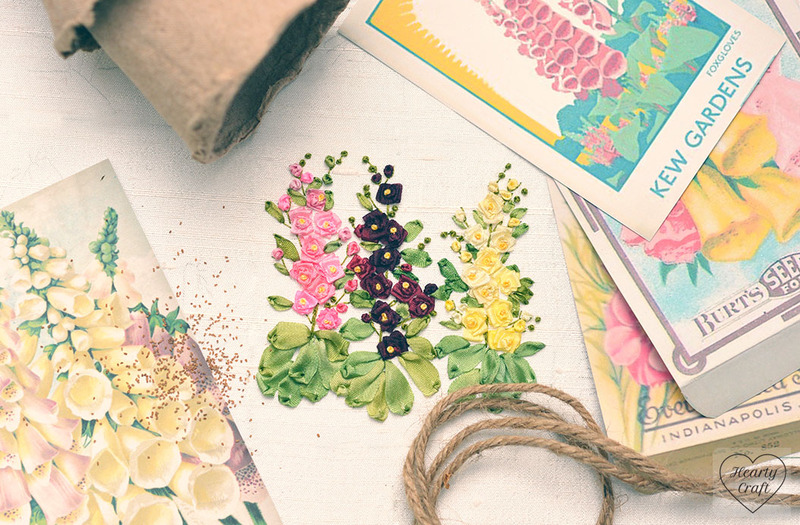 There’s only one stitch needed to create real-looking flowers. 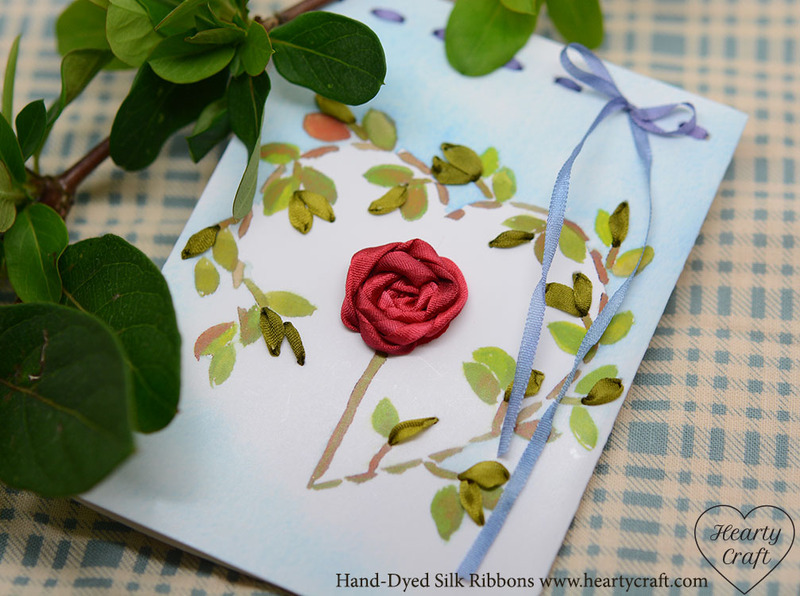 It’s a straight stitch with 7mm (1/4 inch) wide silk ribbon for petals and 4mm (1/8 inch) wide one for leaves. 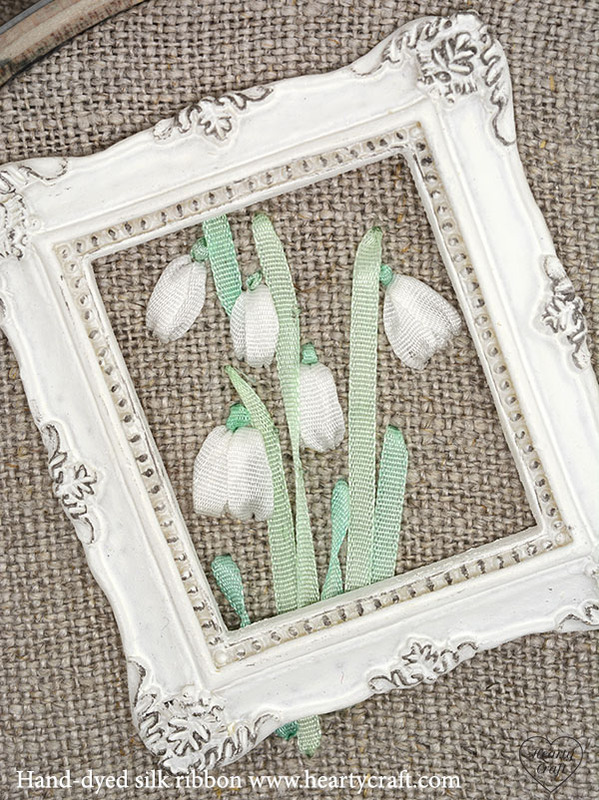 Follow this easy tutorial to embroider a bunch of those beautiful flowers. Two pieces of cotton fabric. You might like to paint a background on one of them with watercolour paints like I did. This entry was posted in Blog Posts and tagged Free Patterns, Silk ribbon embroidery, Tutorial on 20th January 2015 by Zinaida.